20110210 - Rang awake by a call. Sad news on the line. Howard 'Bud' Kraft, Lori's grandpa, left us this morning. I remember him as a very nice happy man and always will. We stumbled through our days and rushed through our dinner. 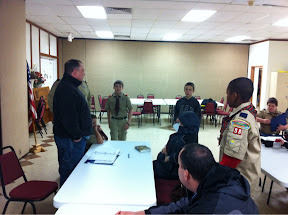 I took D to strength training and then rushed to a scout meeting: the last Cub Scout meeting D will ever attend. For many years I walked with him through the ranks of Cub Scout. From here on he walks alone as a Boy Scout. I'll be close behind though. D and I stopped for coffee and cocoa for a minute. Just to stop. To look eachother in the eye. The rushing one day for all does stop. We need to look at eachother. PS - Exactly 4 years ago today Grandma Winger led the way.